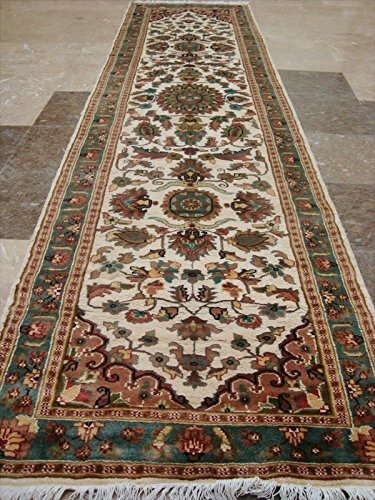 Awesome Ivory Flowral Medallion Beautiful Designed Hand Knotted Soft Hall Way Runner Rug (9.7 x 2.6)'. For the perfect combination of unique, beautiful style and high-quality durability, the attention to detail on these beautiful contemporary rugs is noticed as soon as you lay eyes on the carpet. The rug to appear dull when viewed from one side, and shiny from the other side. Please view the picture at the bottom to see the bright side of the rug. This rug can help brighten up a room if you do not get much sunlight. Simply put the bright side facing the seating area and it will make the room appear surprisingly bright. Rectangle shape with excellent floral pattern. Ideal choice for the modern family room. Blended color schemes match well with all styles of furniture and art. Give your home an elegant touch with this amazing rug carpet. Great for any decor, adds texture to the floor and complements any decor. 100% Genuine Hand Knotted-Rug not hand tufted like other sellers.